For the Volvo V40 hatchback sold from 2012, see Volvo V40 (P1). The first generation (1995–2004) was introduced in 1995 with the S40 (S from saloon) and V40 (V from versatility, estate) cars. The second generation (2004–2012) was released in 2004, and the estate variant's name changed to V50. The range was replaced by the Volvo V40 five door hatchback in 2012. During August 1995, Volvo released its new series, with the intention of calling the cars S4 and F4. However, as Audi had already reserved the "S4" name, Volvo opted to name the range S40 (saloon), and V40 (estate). These cars were manufactured at the Nedcar factory in the Netherlands (a pre Ford joint venture between Volvo and Mitsubishi Motors) and based on a common platform with the Mitsubishi Carisma and the Proton Waja. In the United Kingdom, it cost approximately 50% more than the related Mitsubishi Carisma. The car helped changed perceptions of Volvo: "The S40/V40 range was the car that finally persuaded buyers that Volvo really could build a credible compact executive car", reported the RAC. The V40, with a drag coefficient of 0.32, was the first whole model to be introduced under the direction of the British designer Peter Horbury, Volvo’s design director, and was marketed in Australia, South America and the Far East. The V40 was named the ‘Most Beautiful Estate Car in the World’ at an Italian award ceremony. The official première was at the Frankfurt Motor Show, in September 1995, with the V40 premièring in December 1995, at the Bologna Motor Show. In July 2000, Volvo updated the 40 Series ("Phase II"), implementing a number of technical improvements, including improved engine management, diesel direct fuel injection, extra safety features, larger brake discs, new front suspension and steering, revised rear suspension, larger tyres and a wider track. A minor facelift gave more streamlining, slightly different front wings and front bumper, and larger front indicators, as well as minor instruments and fascia re design. The "Phase II" 40 Series finally went on sale on the North American market for the model year 2000. The 40 Series cars were equipped with four-cylinder engines, such as a 1.9 turbo diesel or 1.6 (1588 cc), 1.8 (1731 cc, later increased to 1783cc), 2.0T (1948 cc), 1.9 T4 (1855 cc, later increased to 1948cc) or 2.0 (1948 cc) fuel injected gasoline engines all of which are derivatives of the modular whiteblock engine series that started life in the Volvo 960 and carried in both 5 and 6 cyl formats in Volvo's bigger FWD cars. There was also a 1.8 L (1834 cc) petrol direct injection engine provided by Mitsubishi as part of the platform sharing between the 40 series and the Carisma. The Volvo S40/V40 series was a completely new car from the ground up, only one engine – the 1.9 turbo diesel – carried over from the old 400 Series. The low (2.0T) and high (1.9 T4) pressure turbo variants were positioned at the top of the motor range. The 2.0T was rounded down and badged as 1.9T and was the only engine available in North America. The five speed manual transmission, widely available in Europe, was not certified in North American S40s, with the five speed automatic as the only option. No electric CVT transmission was planned, unlike the 440 HTA / High Tech Auto CVT that had been released before the 400 series was completely phased out. In the United Kingdom, trim levels were S, XS, SE and CD. Later on, trim levels offered were supplemented with SE Lux and Sport Lux trim designations. A limited edition 'Xi' trim level was also offered for a short run on Phase 1 and Phase 1.5 cars, often painted yellow with black bezel headlamps. The Volvo S40 was the first car to earn a four star Euro-NCAP safety rating. The S40 was homologated for racing in the Super Touring category on 1 January 1997. It competed in the British Touring Car Championship with Tom Walkinshaw Racing between 1997 and 1999 with Rickard Rydell winning the 1998 title. In Australia, Rikard Rydell and Jim Richards won the 1998 AMP Bathurst 1000. The S40 also competed in the Australian Super Touring Championship with Volvo Dealer Racing in 1998 and 1999, with Volvo winning the Manufacturers Championship in its second year. It also competed in the Swedish Touring Car Championship and the 2003 Norwegian Touring Car Championship. The Volvo V50 is the wagon variant of the S40. Introduced in the beginning of 2004, the second generation S40 (known as the 2004.5 Volvo S40) introduced a new design based on the Volvo P1 platform built at the Volvo Cars factory in Ghent, Belgium. At the same time, the V40 was replaced by the estate V50, also based on the P1 platform and built in Ghent. The S40 was nominated for the World Car of the Year award for 2005, and won the Canadian Car of the Year Best New Sport Compact award for 2005. It was also elected the South African Car of the Year for 2005 by the South African Guild of Motoring Journalists. The chassis for this car and the majority of its components were developed by Volvo, however similar mechanical components can be found in the Mazda3 and the European Ford Focus. It had the latest generation of Volvo's modular five cylinder engines. The inline fives were frequently improved upon by Volvo since the engine's debut in 1991 for the 1992 model year Volvo 850. 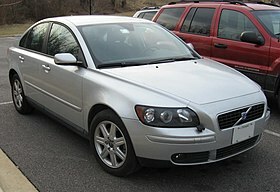 The top of the line S40/V50 T5 AWD, as well as the 2.4 and 2.4i, powertrain is still made by Volvo. The transmission is developed with Getrag at Volvo's Koping Transmission Center in Sweden, and the AWD system bought from Haldex Traction of Sweden. The S40/V50 T5 (one of the several variants) features the 2.5 L B5254T3 (later B5254T7) (2521 cc) five-cylinder fuel-injected engine with a light pressure turbocharger. The valvetrain has four valves per cylinder and is a DOHC design. The engine is transversely mounted at the front of the vehicle and was available with the M66W (front wheel drive) or M66C (all wheel drive) transmissions. In the United States, the manual (six speed) transmission was only available on the V50 in 2006, 2007 and 2010 and only with AWD and R-line trim. The initial 2.0 diesel engine was the DW10, produced by PSA. A new range of engines and transmissions were introduced at the end of May 2010 (see "engine specifications" below). There was also 1.8 L (Mazda L engine) petrol version available in the European markets. Volvo launched an advertising campaign for the S40 titled The Mystery of Dalarö, using a documentary style video approach. The eight minute film was credited to fictitious Venezuelan film maker Carlos Soto. In fact, as was disclosed later, it was directed by Spike Jonze. The film is set on 25 October 2003, where 32 people supposedly purchased a Volvo S40, at the same local Volvo dealership in Dalarö, a small village to the south east of Stockholm. In addition to this film, a four minute documentary of the documentary, calling into question the validity of the events, was posted as Soto's "personal edit" on his alleged homepage. The S40 was the first Volvo car to be launched in China by the brand under the Changan Ford joint venture and commenced production in March 2006. Engines choices consisted of the 2.0, 2.4 and 2.5 litre petrol engines paired with either a 5 speed manual or 6 speed dual clutch gearbox. The S40 was refreshed for April 2007. Improvements include improved audio systems, increased storage space and new safety features like emergency brake lights which flash rapidly during hard braking to alert traffic behind the car. The new S40 also comes with optional active bi xenon headlights which point the light beam in the direction of the road as it curves (standard in SE Lux models). There was also an optional BLIS (blind spot information system) camera located on the side mirrors which alerts the driver of passing vehicles beside the car. Volvo released the 2.0 litre diesel Powershift on the third week of February 2008, except in Ireland, where it was released in the last week of May, because of delivery intervals. The T5 model received a new engine (the B5254T7) with a performance increase of 9 hp (6.7 kW), giving an output of 227 hp (169 kW). The D5 engine became available with a manual gearbox offering 400 N⋅m (300 ft⋅lbf) of torque and an automatic transmission offering 350 N⋅m (260 ft⋅lbf) in the second half of 2007. The model of 2009 saw rear end boot lid changes, with wider spacing of the 'Volvo' lettering and larger characters, as in the newer Volvo models. In 2010, the new, larger, circular Volvo logo appeared on the front grille, in the United States, a manual transmission was briefly available with the T5 AWD version. In North America, the naturally aspirated five cylinder engine, all wheel drive, and manual transmission were all dropped for the model year of 2011, leaving only the automatic, front wheel drive T5 in base and R-Design trims. The model year of 2011 was the last for the S40 in the United States and Canada. From the end of May 2010, a new range of engines were available for the so called "2011 model". The range now included three petrol engines (1.6, 2.0 and T5, the latter only available with front-wheel drive and automatic transmission), four diesel engines (the existing DRIVe and the new D2, D3 and D4) and the 2.0F flexible-fuel engine that can run either on normal petrol or E85, an ethanol petrol mixture. Production ended in May 2012. The updated 2.0 and T5 and the new D2, D3 and D4 are compliant with the Euro 5 emission standard (the rest are Euro 4 compliant), and the DRIVe included a start-stop system for reduced fuel consumption and emissions. New six speed gearboxes are used in the D2 (manual: B6 D2), D3 and D4 (manual: M66D, automatic: Aisin AWF21). 4-cyl. 4-cyl. Turbo 4-cyl. 5-cyl. Turbo 4-cyl. Turbo 4-cyl. Turbo 5-cyl. Turbo 5-cyl. Turbo 4-cyl. ^ The second generation only. ^ "Volvo S40 Production Statistics". Retrieved 2018-01-03. ^ "S40 Technical specifications" (PDF). Volvo Car Corporation. 1997. p. 3. Retrieved 2018-01-06. ^ "2001 Volvo S40 & V40 owner's manual". new.volvocars.com. Volvo Car Corporation. 2000. p. 127. Retrieved 2018-01-03. ^ "Volvo V40 technical specifications" (PDF). Volvo Car UK Ltd. April 2003. Retrieved 2018-01-06. ^ "2003 Volvo S40 & V40 owner's manual". new.volvocars.com. Volvo Car Corporation. 2002. p. 127. Retrieved 2018-01-03. ^ John Tylee (10 November 1995). "NEWS: Abbott Mead wins Euro Volvo launch". Retrieved 2018-01-03. ^ Diana T. Kurylko (4 September 1995). "Shake up at Volvo". www.autonews.com. Retrieved 2018-01-03. ^ "Volvo Model Year Range 1996" (PDF). Volvo Car UK Ltd. October 1995. p. 3. Retrieved 2018-01-06. ^ Av Redaktionen (22 September 2010). "Audi S1 var nära, mycket nära" [The Audi S1 was close, very close]. Auto, Motor & Sport (in Swedish). Archived from the original on 2017-09-09. Retrieved 2018-01-06. ^ a b c d "Volvo V40 model year 2003" (PDF) (Press release). Volvo Car UK Ltd. 2003. p. 4. Retrieved 2018-01-06. ^ "1990 – 1999: A historical review". www.media.volvocars.com. Volvo Car Corporation. 8 January 2000. Retrieved 2018-01-06. ^ "Redbook". Redbook. Retrieved 2011-11-13. ^ "2001 Volvo S40 & V40 owner's manual". new.volvocars.com. Volvo Car Corporation. 2000. p. 123. Retrieved 2018-01-03. ^ "2003 Volvo S40 & V40 owner's manual". new.volvocars.com. Volvo Car Corporation. 2002. p. 123. Retrieved 2018-01-03. ^ "2004 Volvo S40 & V40 owner's manual". new.volvocars.com. Volvo Car Corporation. 2003. p. 123. Retrieved 2018-01-03. ^ a b "Welcome to VolvoCars-PR.com". 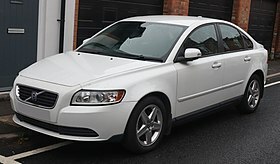 www.media.volvocars.com. Archived from the original on 2011-10-09. Retrieved 2011-06-15. ^ "CONTINUED STRONG GROWTH FOR VOLVO CAR CORPORATION IN 2001 – Volvo Car Group Global Media Newsroom". Media.volvocars.com. Retrieved 2015-09-21. ^ "Volvo Car Corporation Increased in Europe 2002 – Volvo Car Group Global Media Newsroom". www.media.volvocars.com. Retrieved 2015-09-21. ^ "Volvo Car Corporation Increased in 2003 – Success for the Volvo XC90 and a record year in the USA". www.media.volvocars.com. 21 January 2004. Retrieved 2015-09-21. ^ "Volvo V40 (1995–2004)". www.media.volvocars.com. Volvo Car Corporation. 27 June 2013. Retrieved 2015-09-21. ^ "Homologated Vehicles". www.supertouringregister.com. Retrieved 2016-09-27. ^ "Facilities |". Ford Motor Company. Archived from the original on 2010-12-08. Retrieved 2010-11-24. ^ "2005 Volvo S40 owner's manual". new.volvocars.com. Volvo Car Corporation. p. 185. Retrieved 2015-06-19. ^ "2008 Volvo S40 owner's manual". new.volvocars.com. Volvo Car Corporation. p. 250. Retrieved 2015-06-19. ^ Consumer Reports Cars Ratings & Pricing Guide Spring 2007. ^ "The Truth behind The Mystery of Dalarö". The Volvo Owners Club. 25 March 2003. Archived from the original on 2006-09-27. Retrieved 2013-07-05. ^ "Volvo's spoof within a spoof for the S40- Mystery of Dalarö". Adland.tv. 13 February 2004. Archived from the original on 2013-04-18. Retrieved 2013-07-05. ^ "Volvo S40". Volvo Car Corporation. Archived from the original on 2018-05-13. Retrieved 2018-05-12. ^ "Volvo Cars of North America's 2011 Full Line Changes and Updates" (Press release). Volvo Car Corporation. 21 June 2010. Archived from the original on 24 June 2018. Retrieved 12 May 2018. ^ "Volvo Cars 2011 upgraded engines". Volvo Car Corporation. Archived from the original on 2018-05-13. Retrieved 2018-05-12. ^ "Volvo S40 Technical Specifications" (in German). Volvo Cars Germany. Archived from the original on 2010-02-12. Retrieved 2010-05-28. ^ "2011 Volvo S40 Technical Specifications". Volvo Car Corporation. Archived from the original (XLS) on 2011-07-17. Retrieved 2010-06-13. ^ "Volvo - S40 II (facelift 2008) - 2.5i AWD MT (220 Hp) - Technical specifications, Fuel economy (consumption)". www.auto-data.net. ^ "Welcome to the Volvo Cars of Canada Newsroom". www.media.volvocars.com. Archived from the original on 2018-01-04. Retrieved 2012-01-06. ^ "VPS Registreringssiffror per bilsegment - september 2011" [VPS Registration figures per car segment - September 2011]. www.media.volvocars.com. September 2011. Archived from the original on 2011-10-09. Retrieved 2011-06-15. ^ "Welcome to Volvo Cars Newsroom". www.media.volvocars.com. 12 May 2011. Archived from the original on 9 October 2011. Retrieved 15 June 2011. ^ "Welcome to Volvo Cars Newsroom". www.media.volvocars.com. Archived from the original on 2013-01-24. Retrieved 2012-01-06. ^ "Volvo S40 (1995–2012)". www.media.volvocars.com. 27 June 2013. Retrieved 2015-09-21.